In 2012, Andre Rodriguez was attending the Art Institute in Los Angeles and working on his senior thesis for Audio Music Production. He decided that he rather create his own original content versus finding a band to record their music. Ultimately, this became the beginning for Coat Check Girl. The first song written for his thesis was “Yellow | Blue | Red” which was inspired by a song he heard by a Colombian artist. Rodriguez also took inspiration from what would become his favorite band, My Chemical Romance. As the project was coming along, he enlisted the help of his friends who assisted in tracking vocals, drums and violin as well as his brother who tracked bass while visiting from out of town. After he finished recording and began the mixing and mastering process, he received a decent amount of positive feedback. Not only were people impressed with the music, but they requested to see the band perform live. He wasn’t actively searching for band members, but met Toby Harmans while working for Warner Music. Harmans recognized him from his former metal band and the two immediately hit it off as they were both from Venezuela. They discussed starting a band and as they jammed together, Harmans showed his roommate, Nate Rich, the material from Rodriguez’s thesis. A classmate of theirs, Alfi Lucero, was a bass player looking for a band, and Coat Check Girl was complete. 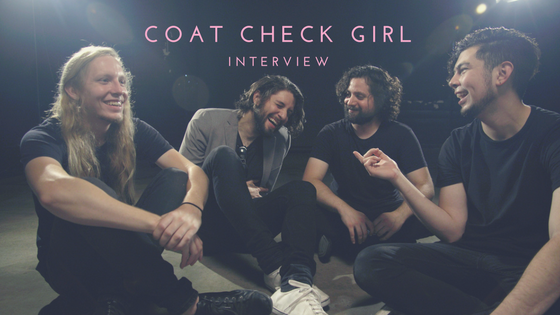 In 2014, Coat Check Girl played their first live show. The songs written for Rodriguez’s senior thesis were on the set list, and since then the band has been creating more original music. Their mentality of letting this project flow naturally has become a staple of their music – a staple that keeps surprising them and their audience.